SINGAPORE -- The defense chiefs of South Korea and the United States agreed Saturday to maintain their robust alliance in the face of North Korea's recent peace offensive. 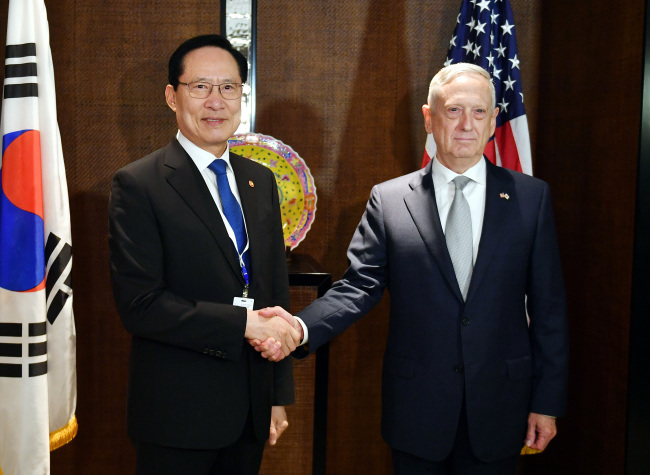 In talks held on the margins of the Shangri-La Dialogue, an annual security forum, in Singapore, Defense Minister Song Young-moo and Secretary of Defense Jim Mattis shared the view that the summit between the North and the US later this month will serve as a "historic chance" for the denuclearization of the peninsula and establishment of permanent peace, according to Seoul's defense ministry. They agreed to bolster "communication and coordination" to provide "military-level" support for the creation of positive conditions for the success of the summit scheduled to take place in Singapore on June 12, the ministry added. Regardless of the security conditions in Korea, Mattis said, Washington's "ironclad" security commitment for South Korea will remain unchanged. When it comes to US Forces Korea, which has around 28,500 service members, he was quoted as telling Song that the Pentagon will maintain the current level of "combat power." Song said South Korea will cooperate closely with the US in pushing for measures to ease inter-Korean military tensions and build mutual confidence. He assured the secretary that all related procedures will be based on the robust alliance. The two sides also agreed to work together for the speedy transition of wartime operational control of South Korean troops from Washington to Seoul. Emerging from the meeting with the Pentagon chief, which lasted about 45 minutes, Song told reporters that they discussed ways for the allies to closely cooperate "at a crucial time." An aide to the minister said the issue of declaring a formal end to the 1950-53 Korean War was not discussed.